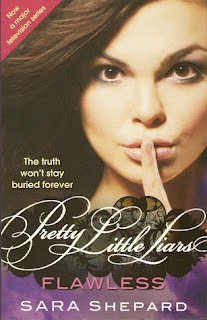 In the exclusive town of Rosewood, Pennsylvania, where the sweetest smiles hide the darkest secrets, four pretty little liars--Spencer, Aria, Emily, and Hanna--have been very bad girls. . . .
Whilst I thoroughly enjoyed reading this book, there didn't seem to be as much happening as there was in the previous book. It was quite sad really in parts because someone (who wasn't one of the main characters) dies, which brings Spencer, Emily, Hanna and Aria together - if only for a short while. My favourite character was Spencer, despite all of her other commitments and the time they had spent apart she still tries to reach out (and sometimes protect) her old friends, whatever the consequences. I really like the cover of Flawless, it represents Aria perfectly, from the girl in the actual image to the purples and pinks surrounding the image.